Theme: God’s faithful and generous people are willing to walk the way of the cross with Jesus—both during Holy Week and throughout life. This Sunday we move from the public theater of the Liturgy of the Palms—Jesus enters Jerusalem on a donkey—all the way to the Liturgy of the Passion, culminating with the crushing scene of his lifeless body placed in the tomb after crucifixion. Like the lengthy previous sentence, it’s a lot to take in during a regular Sunday worship service. It’s a lot for worship leaders and preachers to manage in meaningful and effective ways. And, it’s a lot for congregants to absorb and ponder as they reenter the world of work, school, and myriad responsibilities. We want folks to leave carrying more than eco-friendly palm fronds or palm crosses carefully folded during worship. How, then, can we make this yearly liturgical “tradition” take on fresh meaning and power? 1) This year’s Liturgy of the Palms is from Luke’s gospel. Notice anything missing? Hint: It’s the palms! In Luke’s story, the crowd spreads their cloaks on the ground ahead of Jesus. They honor him as royalty and praise God, but there is nary a hosanna to be heard. It’s one thing to wave a palm branch and sing “All Glory, Laud, and Honor,” but what would it look like to take our coats, sweaters, and jackets off and lay them in the center aisle of the nave for the duration of the liturgy? There’s a little bit more of a personal investment there, right? 2) Notice the air of expectancy that surrounds Jesus’ triumphal entry into Jerusalem. Even the owner of the colt doesn’t balk at having his animal co-opted for this procession of the Messiah. 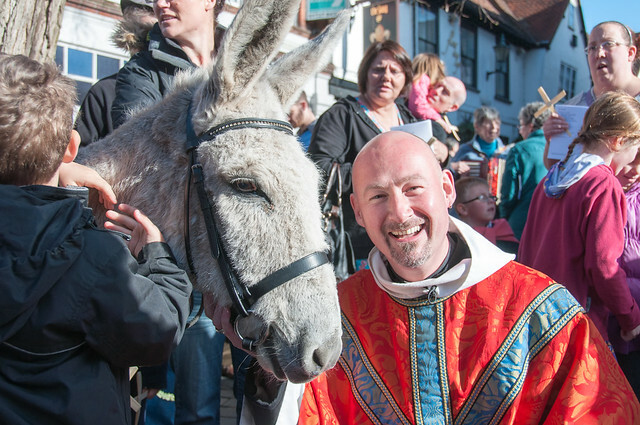 Would you do the same if someone came to take your donkey (or car) with only the words “The Lord needs it”? 3) There had been other claimants to the title of Messiah before Jesus, and there would be more after him, but the humble way that Jesus walked in his authority and his willingness to lay it aside rather than resort to violence is decidedly different, countercultural, and real enough to continue to inspire disciples more than 2,000 years later. 4) The annual recounting of Jesus’ passion makes us ongoing witnesses to these events. Our liturgy this Sunday is not simply a reenactment or reminder. 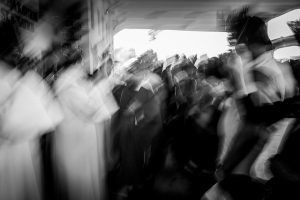 As Christ-bearers, those named and claimed by God in baptism, we are present in a collapse of chronological time and suspended in the divine Kairos time as we gather at the Eucharistic table. In this time/space we become one, Christ’s body. 5) Today’s worship follows a distinct movement from joy and excitement to horror and despair. We descend from a mountaintop moment at the culmination of Lent into the “valley of the shadow” that we will inhabit throughout Holy Week. Even though we know that the tomb is not the end, it is impossible to avoid the journey and the accompanying emotions of grief, despair, and loss. 6) Consider the “In Worship” suggestion (below) as a way to more deeply engage worshipers in the story and accompanying lessons. 7) Use the “Christ Hymn” from the epistle lesson as the basis for a powerful sending, one that acknowledges the reality of daily life and the call to participate in the daily movements and lessons of this week. Click here and scroll down to the “In Worship” section. Print the daily lessons in the bulletin so that folks have easy access to them. Blessings on your preaching, teaching, and worship leadership. And blessings, too, on your own Holy Week personal study, prayer, and devotions. Take good care, my friends, as you walk through the valley of the shadow this week. Easter is coming, but we’re not there yet. Consider altering the order of worship today by reading the gospel as soon as people are seated following the Liturgy of the Palms. Make it a participatory experience with parts identified for worshipers and unison responses for the congregation. Read the lessons from Isaiah and Philippians at their normal place in the liturgy and focus your sermon and call to action primarily on one or both of those lessons. Death can be scary for youth, although some of your youth may have already lost loved ones or peers. Consider inviting a grief specialist, physician, hospice worker, and/or funeral director to talk about death and grief with your youth and to answer their questions. Help them to understand that we can talk about death without fear, because for Christians death does not have the last word. This week’s liturgy is a full one, so you may opt to give the children an active role in the Liturgy of the Palms instead of including a separate children’s time. Have the children lead the procession and spread “cloaks” on the ground (or aisle) for worshipers to process along. You can give them shepherd costumes from the Christmas play, old choir robes, or other stand-ins for “cloaks” (maybe they need a good wash anyway). If possible speak briefly with the children before the process to explain what you are asking them to do and why. Their role is an important one. How will you steward your time during Holy Week? Are you able to commit to reading the daily lessons? Can you be watching for signs of Jesus in the world this week? Will you look for the face of Christ in all whom you encounter? Divide the Passion Sunday gospel (Luke 22:14-23:56) into daily sections (for example, Luke 22:14-38, 22:39-54, 22:55-62, 22:63-71, 23:1-25, 23:26-46, and 23:47-56). Ponder each day’s reading and reflect on who you might be in each story. What might this story look like if it took place today? Take time to avoid rushing to Easter during this week, even though you’re likely making preparations for gatherings with family and friends, dying eggs, and wading through the candy aisle at the store. Sit with the discomfort and pain of the story, trusting that Easter is coming, but being willing to dwell in the shadows during these few days. 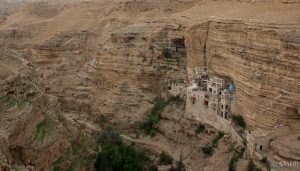 Photos: Richard Gillin, John Raggai, and Mlaeri (Wadi Qelt/St. George’s Monastery), Creative Commons usage license. Thanks!